I am a road-trip kind of girl. There are few things I like better than hopping in the car with my hubs and heading somewhere for the day. We always have such a darn good time! Saturday I had a delivery in the Chicago area, so we loaded up the trailer...hooked up the GPS and took off for the day. First stop...ESTATE SALE. I love, love, love seeing those words on a sign nailed to a post! Here were my finds at that sale...some are to keep...some are to sell...but hands down favorite was the galvanized metal tool box! How cool is that thing, anyway? I was gushing about it the whole way into Chicago. At one point, my so-easy-going-you-have-to-check-him-for-a-pulse-sometimes hubs says proudly "my friend's wives want designer jeans and expensive shoes...not my wife, she wants a dirty old toolbox she crawled on the floor under a workbench full of sawdust to get." After breakfast at a little diner along the way..which, by the way, is a requirement for him spending the day "junking" with me...we were off the the flea market. First stop at the flea market...to see Anita & Judy aka the Iowa Junk Gyspies! Now, I really shouldn't tell you this or I am going to create competition for myself, but if you don't get early, you will be sorry. Trust me on this. The things on their tables grow wings and fly out of there. 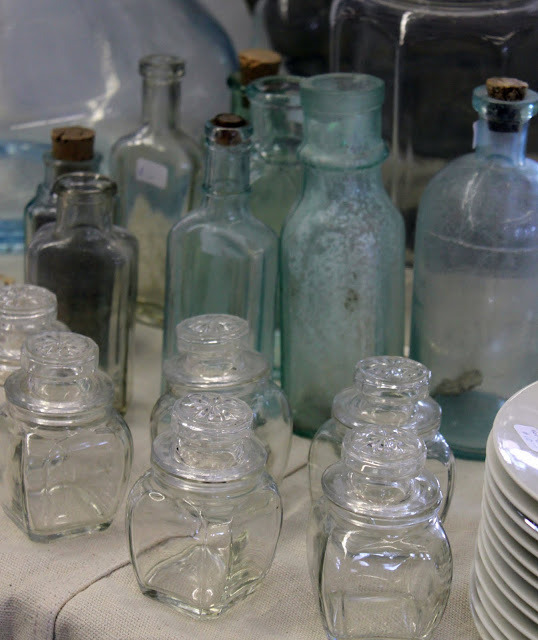 They always have stacks of ironstone, tarnished silver, loads of old bottles...you get the idea...really, really good stuff! 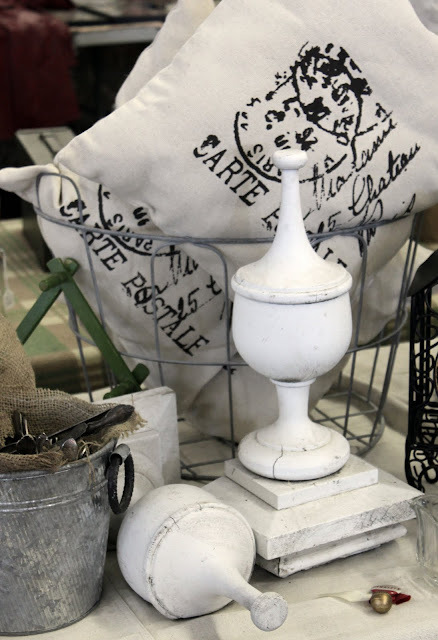 I snagged the basket in the photo below...but why the heck didn't I get those finials?? Kick.my.self. I have a weakness for old glass bottles. I feel the need to buy every one I see. I controlled myself this time...I only came home with 2. That stack of white plates peeking around in the bottom right corner was another kick.my.self moment. Why did I leave those behind? But here is some of what I came home with...love the vintage pig breadboard. He is going to look fabulous on display in my kitchen. And the ironstone bucket...don't even get my started...I am c-r-a-z-y about that thing! I can't wait to fill it with hydrangeas this summer! I was on a mission to find a chandelier...or two. I almost let out this really-embarrassing-for-my-husband squeal when I found a vendor that was actually from my town...and was selling chandeliers! Here is one that I think I might buy...if he didn't sell it. The prices were fantastic! 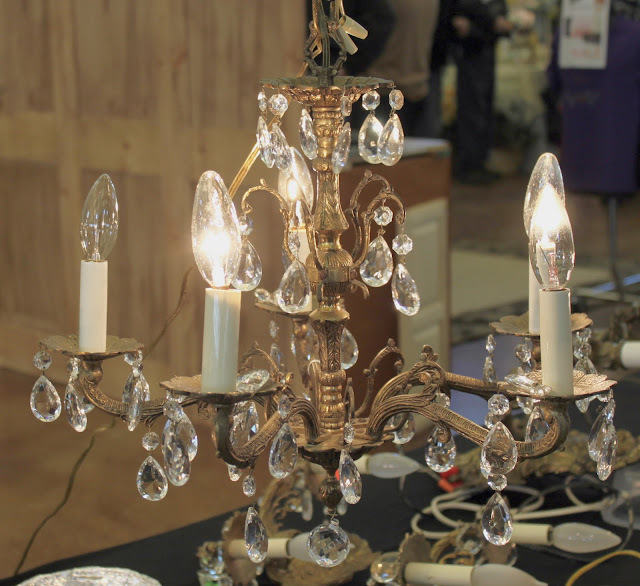 They had about 6 of them at the show...all ready-to-hang...they rewire when they need to, all the crystals are in place and this one even had its original ceiling cap! He wanted $150...I think that was a pretty good price! I didn't buy because I am going over to their house this weekend to see what else they have. He has 15 different chandeliers right now, so I can't wait to get over there to see what else screams "take me home". I am dreaming of an all-glass chandi with crystals for my office. If anyone is looking for one, drop me an email. I plan on taking more pics while I am there. I know how hard they are to find at a good price, so if you see something you like I can ship it! I am off to work on painting my giant 'opera house' cabinet. I am dying to get it done and in place so I can show you! You will never believe it is the same cabinet. Gotta love white paint! I just found your blog and I think we think a lot alike. Climbing in the car with the hub and thrifting and antiquing all day is the best day ever! I am from Illinois, Bloomington to be exact but we now reside in Ohio. 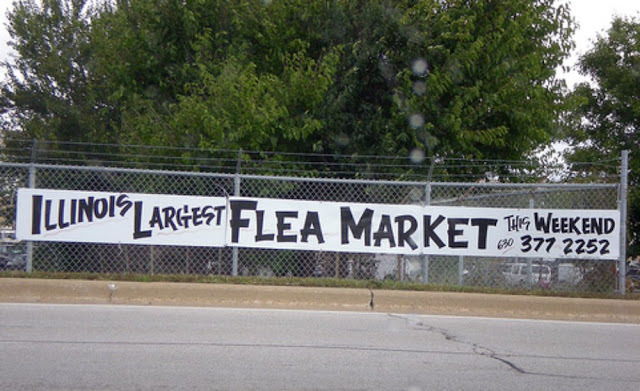 I have been to that flea market before but it's been a long time, might have to check it out sometime this year. I love all your finds! And by the way who needs designer jeans when you can have some great vintage finds instead?? Oh Mary you did good girl!!! Love the french text books. I have a friend who would have a hey day with those. Cute little hotel bells and the lunch pail etc... great finds:) I just got my very own chandelier and I'm in love. Man...did you score or what...I love everything you brought home...the hotel bells, the bread board and your tool box are amazing. I love everything you found! I did make it to a garage sale in the rain on Sunday and got a really cool basket for free! My husband like to tease me. When he sees something he thinks I will love he says in a really loud voice OMG LOOK AT THIS!!!!! great finds..........and from the sounds of it, kane was packed! Wow! You found some fabulous finds - I am crazy about that bread board and the hotel bells. I've been looking for one forever! I love your blog and the items you found. I would love to know what you paid that way I know what range to go with in the future. Girl, one day we have to go junkin' together, we have too! I love everything you picked out and all that ironstone, and I am kicking you for not grabbing that stack of white dishes...ekkk!! I cannot wait to see your cabinet all gussied up and purdy!! You really are the gury of flea market findings! Love. Love. Love. your finds! Especially the hotel bells and clocks. Oh, and the french textbooks too. Wow! You sure have a nice hubby! My hubby says the same thing about me-no designer jeans just take that girl to a thrift store or garage sale and she is a happy camper! Guess they should appreciate a wife that gets all excited over something galvanized (insert jumping up and down) than a 20 karat diamond ring-Oh what the heck I would jump up and down for that too! LOL! Loving the hotel bells, clocks and old books. Oh - and the tool box OH.MY.LOVELY! ah-wow! amazing finds! those finials you passed up on... TOOO cool! 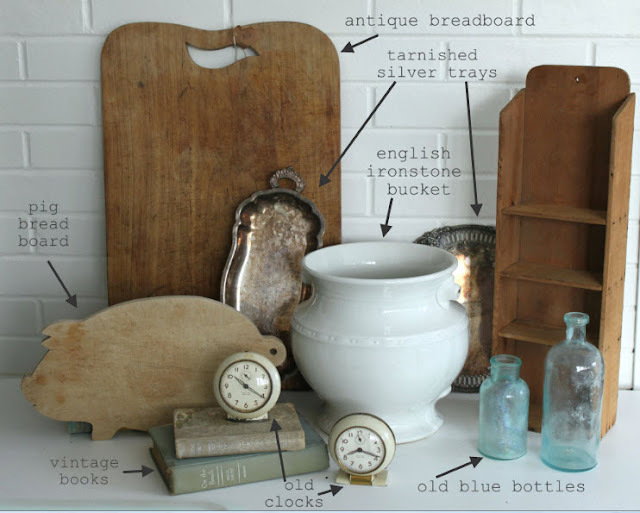 I love all your finds but I am dying over that ironstone bucket.... love it! I always look forward to your blog posts - you find the best treasures! Oh, what fun! I hope that you find just what you're looking for...and I can't wait to see you "new" cabinet all sweet and white! Just stumbled across your blog. It is really pretty. You have a new follower. Fantastic finds, really loved looking at the photos. I especially love those little clocks. thats my favourite type of weekend too, heading out early with my husband. ....hahahahahaha....I thought I was the ONLY one bribing my hubby with food...!! I LOVE all of your Treasures ESPECIALLY the hotel bells....LOL...I have one on the bedside table that I use to 'summon' my evening coffee... :o) !! So jealous that you got to go my MY flea market. I grew up outside of Chicago and we went there almost every month. It is where I developed my love for antiques at a young age. It looks like you had a great time! I sure do miss my flea market. I am GREEN with envy that ya made it to the Kane County Flea! The pig cutting board is FAB! The pig cutting board is the bomb!!! 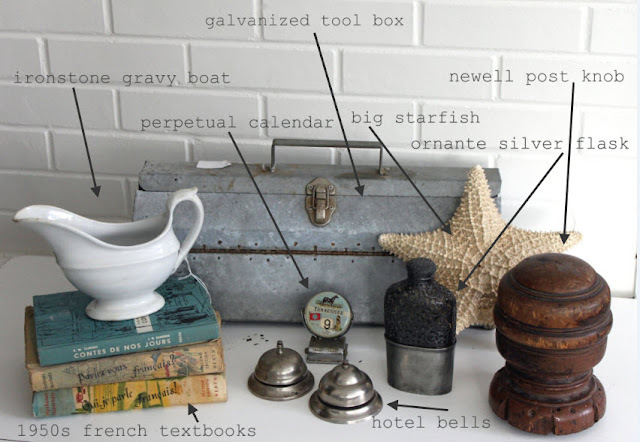 Love the metal tool box...excellent finds and love your blog too! ... wait ... what ... whoa, do we need to be friends? omg, Mary, thats too funny.I went to Kane on sunday and bought that gosh darn finial along with those awesome patinaed plates.If ya get a chance: stop by Josie's Antiques in Maple Park this weekend.I will be working the store all weekend and Monday as well. The barn and out buildings are chuck full of stuff. Wear boots, lol.It gets pretty muddy, but we know how you like to get paint/dirt under your nails! You lucky duck, what a fabulous day!!!!!!!!!!!! So cool that your husband "gets" you! Sadly, I missed this month's flea :( You picked up some really fabulous stuff my friend!!! I always enjoy seeing the items that you score. Such a lucky lady. What a fabulous day that you had. Plenty of scores. I hate to say, "I'm jealous" but "I'm jealous" all in good though. Good luck on getting your chandler, I can't wait to see which one you pick out. I found it in a antique mall way out in the desert of California, I painted it,, aged it washed it with a gray patina to give it an aged look and chippy look as well. Then I placed it in my shop for $250.00. I know it was a great find and a great sale...but I was really sad to see it leave the shop :( Well hang onto that one! so you won't have a sad face like mine. ... let's hook up ...ask us about the farm market at anne marie's in May! That flea market sounds amazing, and the stuff you got is fabulous! Love those little tarnished trays and the ironstone. Sounds like a perfect day to me too! first time to your blog, and i am addicted :) great photos and inspiration!